Facial aging is the results of two factors, gravitational drooping of the facial muscles and loss of volume and thickness of the soft tissues and skin of the face. These changes create folds, contours and shadows in the face that make us look tired, stressed and simply older. The heart shape face of youth becomes more rectangular with jowls widening the appearance of the jawline which loses the definition. Facelift surgery improves these signs of aging to restore a more refreshed and youthful facial appearance, often turning the clock by 10 years or more. Facelift techniques corrects the sagging facial tissue, the jowls, the drooping skin under the chin (“turkey neck”), dropped cheeks, and deep creases from the outer nostrils to the corners of the mouth (nasolabial folds). When performed correctly by a specialized facial plastic surgeon like Dr Jacono, the procedure achieves a natural, beautifully revitalized version of yourself. 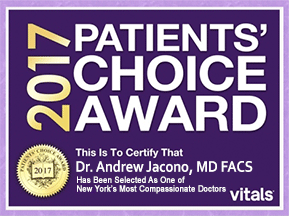 Dr Jacono is considered by his patients to be one of the best facelift surgeons in New York City, and by his peers one of the best facelift surgeons in the world. If your face has sagging and other significant signs of aging, it might be time for a facelift in New York City from Dr. Jacono. To see if you are a candidate, place your hands along the middle part of your jaw with your index fingers pointing upward and thumbs under the jaw, and pull gently upward, vertically against gravity. You may be a candidate for a facelift if you like the results. Dr Jacono wants potential patients to understand that a vertical facelift is the correct procedure, and that pulling back toward your ears like most surgeons do will create pulled corners of the mouth, or “puppet mouth” that plagues many Hollywood celebrities. Mini Facelift Before and After. 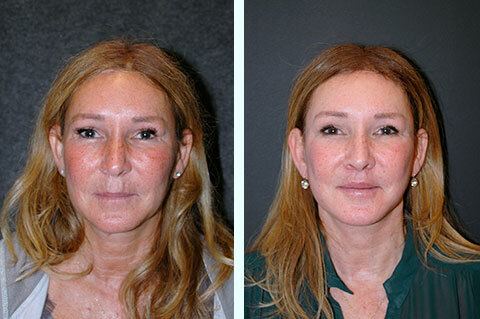 This woman in her fifties had a mini facelift with a short scar approach. Her hair is pulled back after surgery and there are no visible incisions. This is the ponytail approach. Your look older than you feel. Your look older than your actual age. Non-surgical treatments such as Botox, injectable fillers, facial lasers, and skin tightening devices do not give you the same rejuvenation they once did years ago. You are looking for a low-maintenance, long lasting (years!) treatment for your aging face. You desire to enhance your appearance for yourself, not to please others. You are in good physical health and good mental health. You are ready to look a decade or younger. 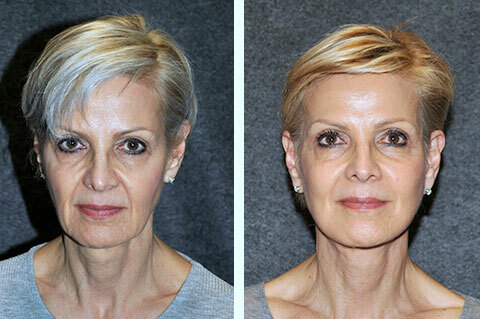 The Benefits of a Facelift from Dr. Jacono? 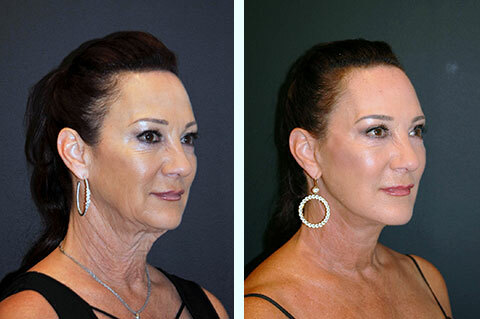 Dr. Jacono uses advanced facelift techniques to provide results that appear completely natural so that people will notice your rejuvenated appearance without the evidence of surgery. His patients tell him that their family members and friends tell them how great they look, but never figure out they had plastic surgery. They think they look healthy, lost weight, look vibrant, or changed their haircut or skin care regimen. They want to know their secrets, but the truth is their secret is a facelift. With his custom tailored approach, the days of looking “pulled” are over. He does not perform a facelift the same on any two patients, and he has performed thousands of facelifts. Dr. Jacono offers different types of facelifts to suit the individual needs of his patients (more on these below). For complete facial rejuvenation. facelift surgery can be combined with other procedures. Sub-SMAS Facelift Before and After. 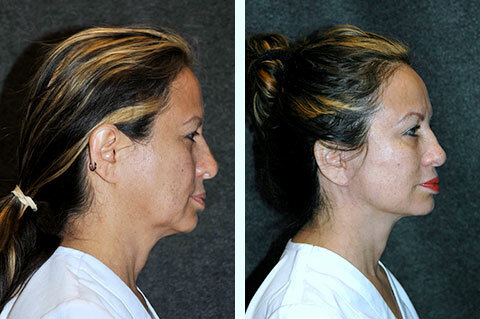 This woman had more significant drooping of her jowls and neck requiring more than a mini-facelift. Sub-SMAS surgery is performed with the SMAS flap or deep plane approach. Dr Jacono’s facelift patients often experience increased confidence and no longer shy away from making appearances because after the procedure they look more attractive and refreshed. They say they feel younger! As the old saying goes, “When you look good, you feel good.” Looking in the mirror every day and seeing a more youthful face is re-energizing. 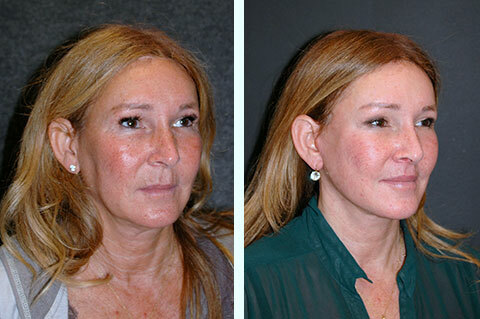 The mini-facelift is not as much surgery as a full facelift which most people do not need. 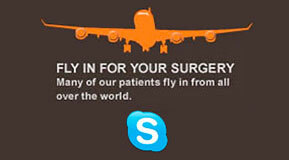 For doctors it is referred to as a “short flap” facelift. It rejuvenates the lower face for patients with mild to moderate sagging that causes early jowls and excess skin in the lower face and neck. This procedure utilizes a mini, “short scar facelift”, or s-type incision creating a ponytail face lift that hides the incision behind the ears around the inside of the small rectangular “tragus” at the opening of the ears, and end behind the earlobes and back of the ear. Ponytail Facelift Before and After. 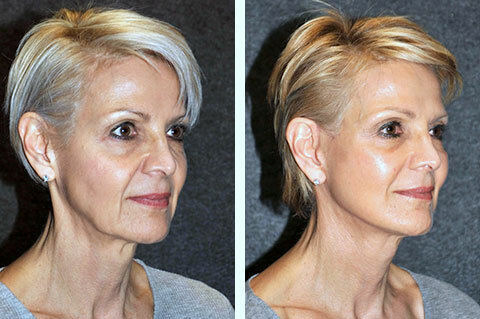 Because of her short haircut this woman required a ponytail facelift approach to make incisions not visible. The SMAS is the underlying muscular system in the lower face. It is tightened as needed for smoother facial contour and an uplifted appearance. The SMAS is not lifted as will be described below for the SMAS flap and deep plane techniques, but is tightened differently. In SMAS plication, sutures are placed to elevate it, in SMAS imbrication it is folded on itself, and in SMASectomy an excessive piece of it is removed and stitched tighter like hemming long pants. For younger patients that do not have heavy jowls or significant facial aging, the mini-facelift is the recommended procedure. Mini Facelift Before and After. This woman is a busy executive and is tired of maintaining her appearance with injectable. 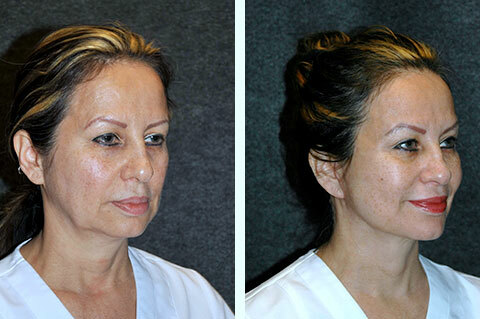 A mini facelift with a short scar approach gave her a long lasting rejuvenation. The lower face and neck get more youthful contours. Resulting scars are almost undetectable once healed. For patients with heavier facial tissues, and more advanced aging, a SMAS flap facelift is indicated. SMAS flap facelift techniques do not simply suture the SMAS up but lift the SMAS and platysma muscle. A muscle “flap” is created, lifting the muscle off the structure of the face, and smoothing it out, almost like lifting the covers up and making a bed. As we age, extra SMAS is created. This extra SMAS is removed and then it is secured higher in the face from which it dropped. 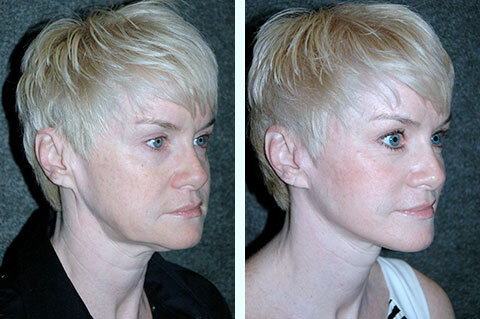 This is a true structural re-engineering that re-supports the beams of the face that weaken with age. Sub-SMAS Facelift Before and After. 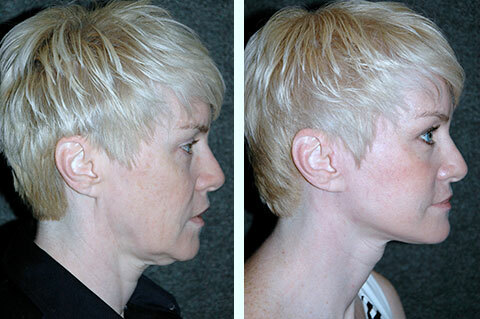 This woman had more significant aging with a heavy jawline and neck without definition. Dr Jacono performed a sub-SMAS surgery with a deep plane approach. 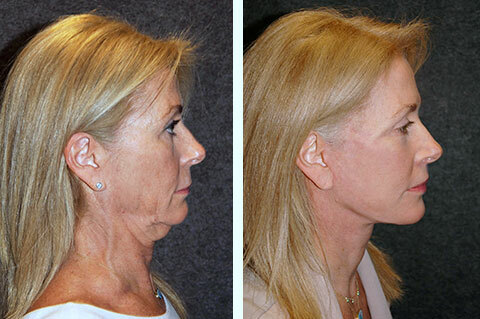 Better results for patients with more significant dropping and heavier neck and jowls. Provides longer lasting results than a mini facelift. 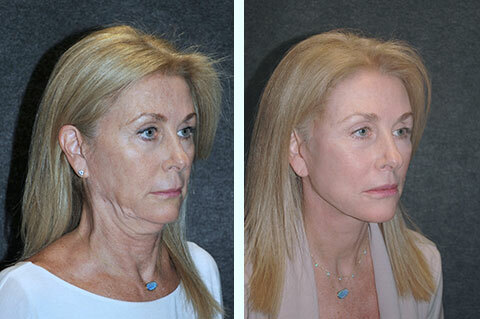 The deep plane facelift is the most rejuvenating procedure in facelift surgery. In addition to the jawline and neck, it lifts the cheek areas using the same incision as the short-flap facelift plus a hidden extension into the hairline behind the ears. The muscle and fibrous tissue are separated from the underlying layers of the cheeks, face and neck. The skin fat and underlying muscles are left connected and moved as a unit, not separated as in SMAS flap techniques. 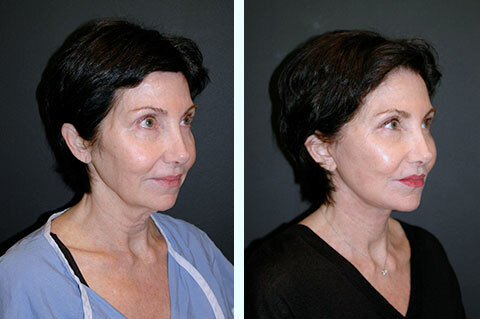 The deep tissues are then lifted using a vertical facelift vector to reverse gravity. 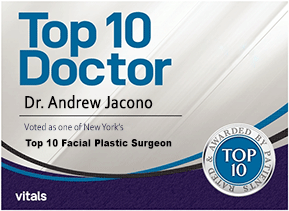 Doctor Jacono is a global authority in deep plane face-lifting and is considered one of the best deep plane facelift surgeons in the world. Many experienced surgeons recognize that the deep plane face lift delivers the most natural long-lasting facelift results. Dee Plane Facelift Before and After. This woman wanted more significant rejuvenation. 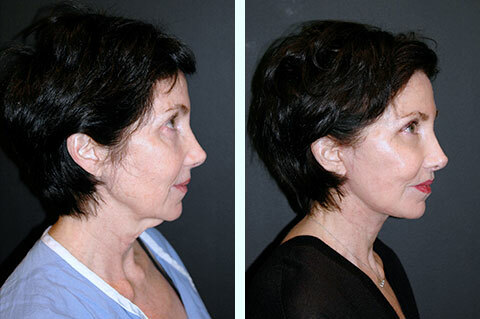 Dr Jacono performed a sub-SMAS surgery with a deep plane approach to lift her cheeks as well as her neck. He performed a lip lift surgery at the same time. Most rejuvenating of all facelift techniques. Lifts the cheeks as well as the jawline and neck. Provides the longest lasting effect of all facelift techniques. There are many people who want some face lifting but are not ready for surgery, either mentally, financially or logistically. Those with early jowls but are not quite ready for a facelift might consider a non-surgical facelift treatment to lift and tone loose or sagging skin. The most state-of-the-art and effective treatments available today are Ultherapy and Thermitight. Ultherapy addresses the deep skin layers as well as the foundational layer that lends support to the skin. This foundational layer in the face is called the SMAS, and in the neck, the platysma. Ultrasound allows me to bypass the upper layers of the skin and deliver the right amount of energy at the right depths to contract and then ultimately lift the SMAS and platysma. Effective and safe ultrasound energy from Ultherapy are used to simulate the supportive layers of the skin and will provide noticeable and natural results. The ThermiTight device uses a small electrode which is inserted under the skin. It then begins to heat the tissue to a clinician-selected therapeutic temperature. Dr Jacono applies gentle movements to heat up the tissues to the desired level. Skin safety is monitored with Thermal Image Guidance®. Because the thermal energy is delivered with the probe under the skin within the subcutaneous (under the skin) fat layer, it melts away excess fat in all areas of your lower face, jawline, and neck. It is not surgery, but some mild bruising that occurs. The probe also glides over the surface of the muscles, thermally tightening them as well. This is why it can be much more effective than the older generation of RF devices (whose probes simply sit on the surface of the skin) like Thermage. These procedures are great for younger patients who want to “stay ahead of the game” as well as those looking to prolong the effects of previous cosmetic surgery. The surface of the skin is not cut or disrupted. Designed to target specifically the deep foundation tissue below the skin’s surface. Non-invasive procedure with little to no downtime. It can be difficult to decide which procedure is right for your appearance and your goals. For this reason, Dr. Jacono recommends a consultation. During this consultation, he will carefully examine your face and neck to evaluate your facial bone structure, features, skin texture, and elasticity. He will note your skin type and how all of your features contribute to your appearance. In many cases, there are small procedures such as chin implants or an eye lift that can contribute to your facelift by emphasizing your natural features and balancing your face. Dr. Jacono will discuss whether any of these procedures could help you meet your appearance goals. The end result should be the total facial rejuvenation you desire.